Of all the boats I&apos;ve ever tested, only a few were really new. That&apos;s not surprising. Boatbuilders are, after all, a cautious lot, and for many reasons—mostly financial—they&apos;re often unwilling to risk doing anything really different. 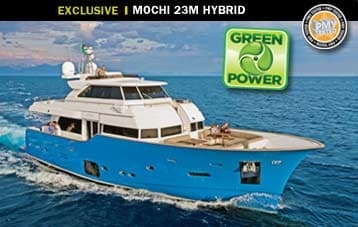 But the Mochi Craft Long Range 23 I tested in Italy can fairly be called not just new but revolutionary. 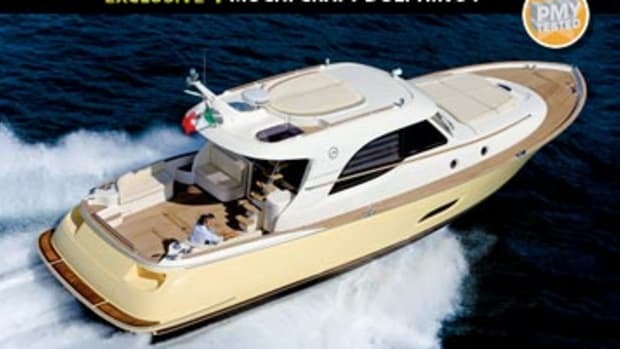 It&apos;s the first of a line of long-range, expedition-style cruisers from a builder heretofore known for sporty, lobsterboat-in-an-Italian-sort-of-way, coastal cruisers, a daring departure in itself. Then there&apos;s the 23&apos;s hull, not just new but unlike anything I&apos;ve ever seen. And if that&apos;s not enough, the 23 also comes with variable-ratio, fly-by-wire steering and twin anti-rolling gyrostabilizers or ARGs. 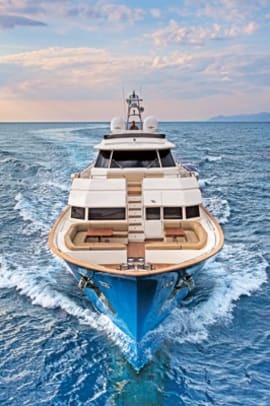 But what really sets this boat apart is her power: an optional diesel-electric hybrid drive system with five operating modes. In Zero Emission Propulsion Mode, port and starboard banks of lithium-ion batteries power two electric drive motors, while in Zero Emission Non-propulsion Mode (at anchor) all of the vessel&apos;s electrical equipment can operate for extended periods off just these batteries—no engine or genset. 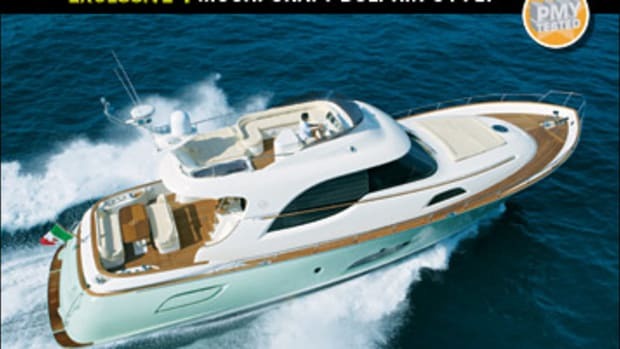 In Diesel Propulsion Mode, twin 800-hp MANs simultaneously propel the boat and recharge the batteries; plug-in mode recharges them from shore power. In a fifth permutation, which can be employed in the event of a diesel-engine breakdown, the operational diesel recharges the batteries while the two electric motors power the props. Before explaining how all this works, it&apos;s fair to ask why anyone would want such a system. Certainly the hybrid option adds complexity, cost (approximately E25,000), and weight (about 3.5 tons). It doesn&apos;t reduce the vessel&apos;s carbon footprint unless you plug into shore power, and then only marginally. If the mains do the recharging it&apos;ll cost roughly another 2.6 gph per engine. No, the real advantage is silence. The two Zero Emissions Modes allow you to motor to an anchorage, stay there utilizing all of the vessel&apos;s amenities—air conditioning and ARGs included—and return to port without starting an internal-combustion engine. In other words, without disturbing anyone on or off the boat. And you should be able to do this through at least 2,000 cycles before the batteries need attention. How far can you go and how long can you stay? That depends on your speed and how much electrical equipment you use. But here are some guidelines based on current ferrite battery technology. (Cobalt batteries, available in a year or so, will significantly improve these numbers.) 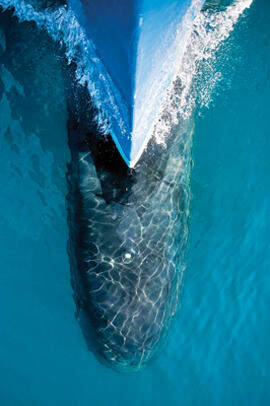 On batteries alone (Zero Emission Propulsion Mode) the boat can run for 11⁄2 hours at 8 knots or three hours at 5 knots. 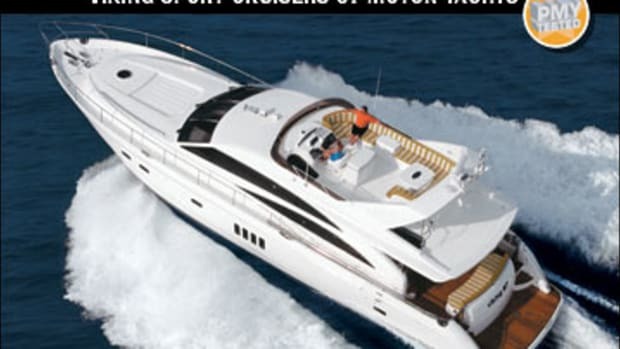 At anchor on batteries alone (Zero Emission Mode Function), it can draw about 20 kVA for 81⁄2 hours. Of course it&apos;s possible to increase these numbers by running a diesel to supplement the batteries. Here&apos;s another way to look at it: You ghost out of a harbor on electric for 30 minutes at 5 knots, stay on the hook for eight hours using 16 kVA, then ghost back to the harbor at 5 knots for 30 minutes, and still have some charge left over. How does it work? 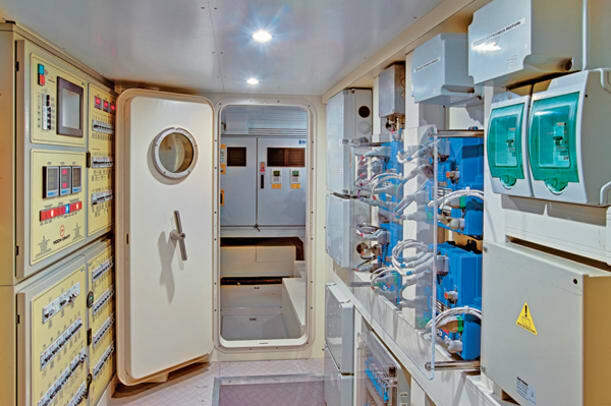 There are three main components: an electric motor/generator (packaged and supplied by ZF) between each MAN diesel and its marine gear, the battery bank outboard of each diesel with a total capacity of 400 amp-hours at 500 volts, and a refrigerator-size inverter/battery charger on the forward bulkhead, dedicated to the lithium-ion batteries. (Twenty conventional batteries provide engine start and house current and are charged in the conventional manner.) Touch screens control the electrical portion of the hybrid system while separate ZF dual-binnacle electronic controls on the bridge, pilothouse, and wing stations each control the diesel and electric motors. Changing from one propulsion mode to another is relatively simple and takes about 30 seconds. Entering electric-drive mode triggers an electric clutch on each gear that disengages the diesel from the electric motor; activating the diesel re-engages the two. You cannot operate one side&apos;s diesel and electric motors simultaneously. Running under electric power is eerie. The propulsion system produces no sound; whatever you hear is made by air and water. Acceleration is leisurely: Standing start to top speed (6.7 knots, although Mochi expects to eventually see 7 or 8) took 35 seconds. (On diesel our 23 hit more than double that in about 25 seconds.) One oddity is the relationship between throttle setting and speed. Full throttle produced 6.7 knots; half throttle dropped that by only 0.6 knots, and 20-percent throttle still generated 5 knots. As for recharge, the diesels alone can restore both fully depleted banks in about four hours; shore power takes about 12. 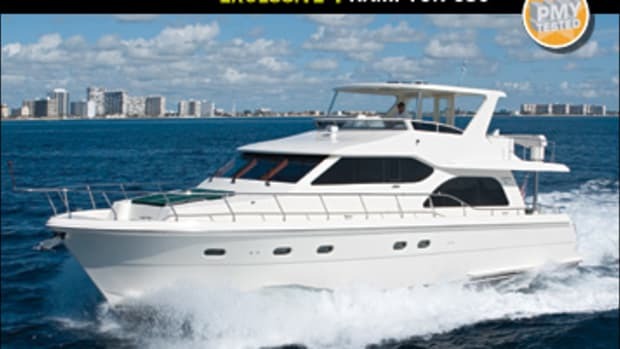 Under diesel power, the 23 feels like any similar boat, with two exceptions. Since the MANs are more powerful than the electric motors—600 kW versus 90 kW—she&apos;s faster—faster even than a conventional displacement vessel. 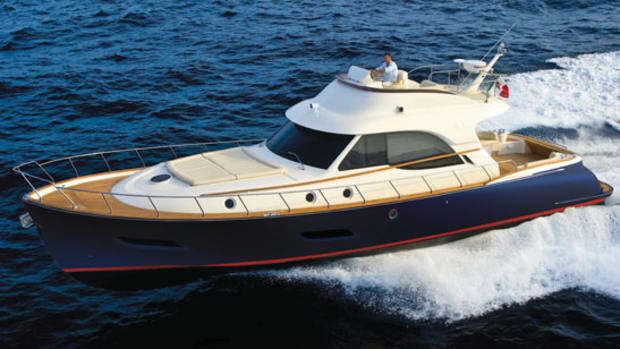 Given a waterline length of 66&apos;8", the 23 has a theoretical hull speed of 10.95 knots. Yet I measured a top speed of 14.6 knots. How so? 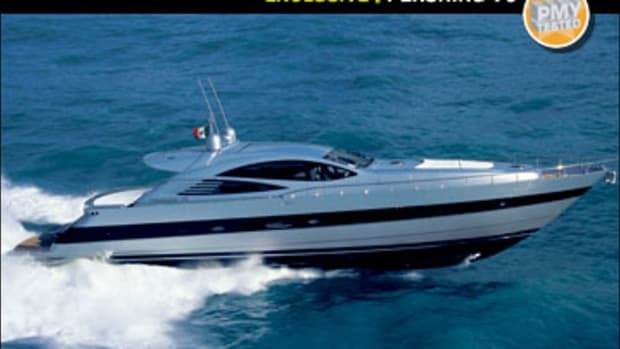 The reason is the hull, the Ferretti Wave Efficient Yacht or FER.WEY. Created by the 136 engineers and 73 naval architects of the Ferretti Group&apos;s Advanced Yacht Technology (AYT) division, it&apos;s a transplaning hull form. 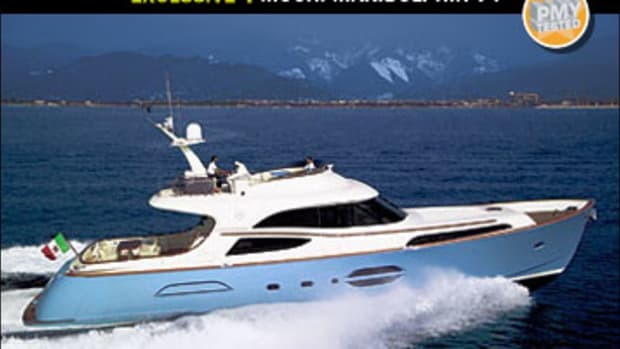 Features include a bulbous bow, relatively flat midsections, and aft sections that warp into extremely deep propeller pockets—so deep, the boat can sit on her keel with neither rudders nor propellers touching bottom. Equally remarkable is the flat running angle: a maximum of 1.0 degree at 2250 rpm and slightly negative readings from 1250 to 1750 rpm. Compare this to typical displacement hulls that tend to squat as they approach theoretical hull speed, then transition to negative (bow-down) readings as more power is applied. I noticed little of that, and what there was I corrected by deflecting the two seven-square-foot canard wings. Mochi claims that FER.WEY also reduces pitch and roll, important considerations on a boat this tall. Although AYT has impressive data comparing FER.WEY to both semidisplacement and planing hulls, between the dead-calm seas on test day and the ARGs, which flattened everything out, I could verify neither claim. My seat-of-the-pants impression, however, is that the boat is pretty stable, although I did notice a tendency to heel outward in turns, not surprising given her long, deep keel and tall profile. 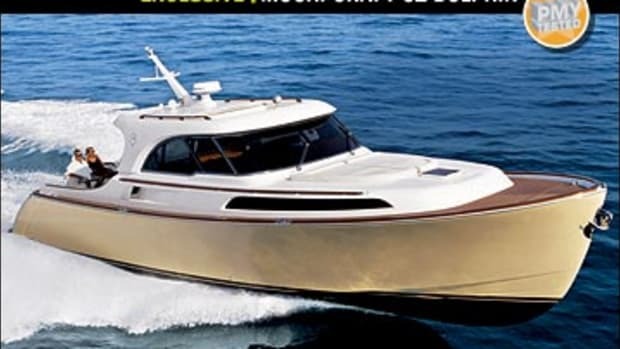 It&apos;s clear that Mochi is serious about this being a true "expedition-style" yacht, and her specs support that: an impressive lamination schedule and a tempered-glass windshield nearly a half-inch (0.47") thick. But to be a legitimate contender, any such boat needs range. 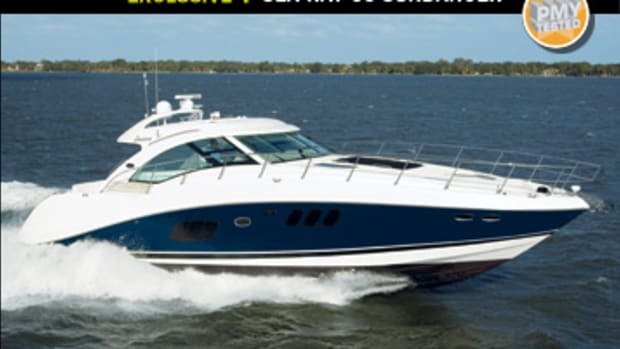 The 23&apos;s 1,900 statute miles is nothing to sneeze at, but does fall short of many bluewater cruisers. The culprit is not efficiency but tankage. Those batteries preclude saddle tanks that might double the 23&apos;s fuel load. Compare her 2,061-gallon capacity to that of, say, the Selene 75&apos;s 3,200 gallons. No word if non-hybrid 23s will have more tankage. Yet horizon chasing doesn&apos;t seem like the primary mission of this boat. Long-range voyaging she can certainly do, but it is long-range thinking that sets her apart from other boats. 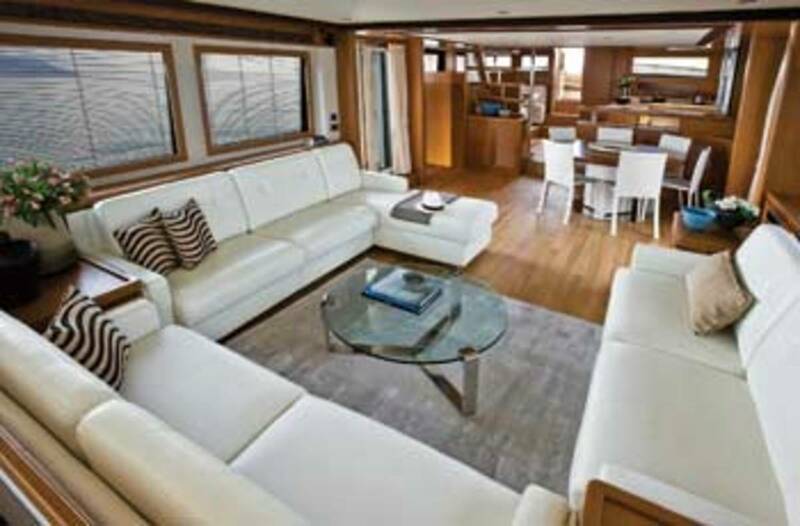 The ability to go somewhere, stay a while in total comfort, and return without disturbing man or beast makes the Long Range 23 arguably the ultimate cruising yacht. For more information on Mochi Craft, including contact information,click here.